Charles Lewis III, with thoughts on writing and voice. I recall Tom Hanks appearing on Inside the Actor’s Studio many, many moons ago and giving a pretty good Q&A with the students gathered. When one asked what it’s like to work in so many different mediums, his response was something akin to “Film is a director’s medium, television is a producer’s medium, the stage is the actor’s medium.” As I write this, I’m having a hard time finding a clip of it and am basing that quote on memory, so please forgive me if I’ve misquoted. Still, I get what that quote is going for, even if I don’t entirely agree: the former two speak of who wields artistic control over their medium, which is not what I’d call the actor’s role in theatre. Perhaps if he added literature, he’d have said the author, but writing a play is very much a form of literature and the preservation of the playwright’s voice is a priority. In film, the author’s voice is secondary (or twenty-secondary) to an appealing visual; in theatre, the voice informs the visuals. So when I heard that August Wilson’s Fences – a play I revere by an author I admire – was finally getting a film adaptation, my interest was piqued. When I read that it would be directed by, and most likely star, Denzel Washington, my heart raced. (And just in time for Black History Month!) 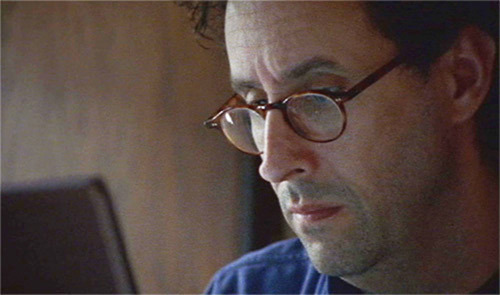 When I read that the screenplay would be written by Tony Kushner… I tilted my head and raised an eyebrow. Don’t get me wrong: I love Kushner as much as the next theatre aficionado and think he’s written two fine screenplays – Munich and Lincoln – for Steven Spielberg. But those were historical events adapted into Kushner’s own voice, something he does all the time. How is he at adapting the voice of another author, let alone one as linguistically distinct as August Wilson? Similar to Wilson in the quote above, I had only a passing knowledge plays adapted for film: I knew of many plays adapted by their playwrights for film (Prelude to a Kiss, A Streetcar Named Desire, Tape); playwrights who tried writing original screenplays (Girl 6 by Suzan-Lori Parks, The Object of My Affection by Wendy Wasserstein), and the countless adaptations of Shakespeare, Greek drama, and so on. Yet I didn’t know much about the history of playwrights adapting OTHER playwrights for film (minus the Shakespeare, et al). I just figured that a playwright would be so protective of their work that one living during the film era would be sensitive about a colleague/rival taking their work to an unfamiliar arena. With this in mind, I decided to research this specific history. I immediately eliminated all films that fell into any of the three categories above and set a rule that the play and playwright HAD TO have existed during the film era, thus creating the possibility for the playwright to have seen it. Just compiling the list was an eye-opening that I couldn’t even complete by the time I wrote this. In some cases, the stage story (which will often be so long as to necessitate an intermission) was streamlined well for the shorter running time of a film, such as with John Logan’s adaptation of Sweeney Todd and Jay Allen’s screenplay for Cabaret. But there were a few cases in which the adapting playwright/screenwriter missed the point of the original work altogether, such as Tyler Perry’s screen version of For Colored Girls… and Jean-Paul Sartre’s screenplay for The Crucible. Again, regardless of how these films may act on their own merits, they represent what every author fears when they turn their work over to another. Of course, August Wilson is no longer around to express such concerns. Which brings me to elephant in the room: there’s a natural concern Black people have when a White artist attempts to recreate Black voices or a White artist filters Black voices through their own point-of-view. I’m reminded of that scene from Spike Lee’s Girl 6 (again, an original screenplay by Pulitzer-winner Suzan-Lori Parks) in which hotshot White film director “QT” (played by Quentin Tarantino himself) condescendingly speaks down to the Black actress he’s auditioning. He boasts that he’s creating “the greatest African-American movie ever made… told from my perspective”. Given Tarantino’s history of tone-deaf recreations of specific non-White-male groups (including the early-20s women of Death Proof), it’s a surprisingly meta moment. I wonder if Parks conceived that scene herself, or at Lee’s suggestion? Norman Jewison frequently recalls the years he attempted to make a film about Malcolm X with a screenplay by David Mamet. When Jewison felt he wasn’t hitting the mark, he asked Lee – then fresh off directing Do the Right Thing – for his opinion. Lee told him rather bluntly that Jewison was “telling the story a White man would tell”. Eventually Jewison dropped off the project and Lee took over. It doesn’t mean that a White man should never adapt a non-WM male voice (or vice versa), it just means that those who are NOT White males have earned the right to be cautious whenever it does happen. If you hadn’t noticed, we have a bit of a bad history with that sort of thing. And yet, as a theatre artist and film-lover (ethnicity aside for a moment), I wonder why an author with such a distinct voice would even bother with an adaptation if it’s only to preserve the original voice? I could only imagine what would happen if he ignored it, but it would still intrigue me as a Kushner experiment. Kushner is a great writer, but in a Tony Kushner way, not an August Wilson way. When news of the collaboration broke, playwright Lynn Nottage took to her Twitter page to express skepticism similar to my own. She eventually deleted those tweets and wrote “#Replacejudgementwithcuriosity I’m enormously excited [..] Beauty must flourish”. I guess that’s the best any of us can hope for. Charles Lewis III considers one of his proudest theatre accomplishments to be working with actors who worked with August Wilson. Charles Lewis III, meditating on August. This February would have been the 70th birthday of one of the most influential playwrights of the 20th century. This October will mark the ten-year anniversary of his death. 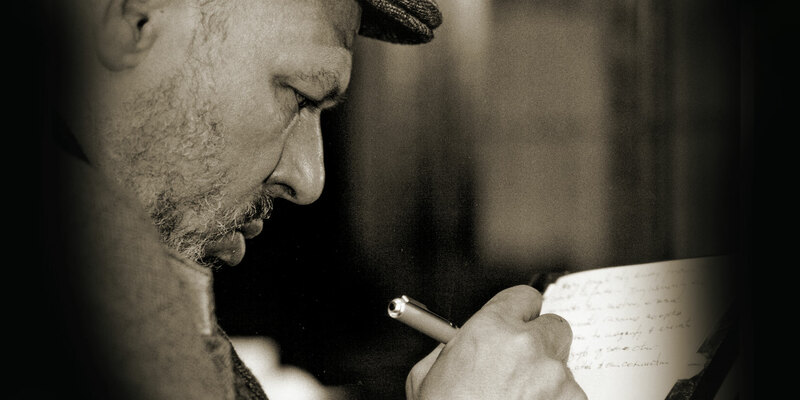 For the best and worst reasons, 2015 is year of the late August Wilson. April 27th was observed as “August Wilson Day”, revivals have sprung up everywhere – here in the Bay Area, Oakland’s Lower Bottom Playaz are staging King Hedley with Radio Golf set for December, and SF’s Multi-Ethnic Theater staging Two Trains Running – and radio station WNYC is hosting readings of his entire American Century Cycle with name actors. All fitting tributes for a man who, to this day, can be a divisive figure in the Black community. Talking about theatre in general can be a divisive topic in the Black community, mainly due to incredibly myopic perceptions. Someone remembers reading A Raisin in the Sun in school, maybe seeing a Bring in ‘da Noise, Bring in ‘da Funk matinee, and maybe hearing the name “Lynn Nottage” thrown about. Black theatre artists have to fight the perception that theatre is a “bougie” hobby that occasionally produces a nice gospel play that you can take your mother to. August Wilson never made those plays. It’s all the more paradoxical that his work would ever be considered “bougie” when he was told his writing would never appeal to White audiences. Jazz played crucial role in his writing and his dialogue took on a musical quality. It was also unapologetically political, though not in the way of an Amiri Baraka. Wilson wrote from a personal place and fought hard to maintain the artistic integrity of his work. He shunned Paramount Pictures’ offer to adapt his Pulitzer-winning Fences because the studio wouldn’t hire a Black director. The lack of a Hollywood adaptation might explain a lack of greater recognition of his work. He wasn’t a media darling like former Black theatre staple Tyler Perry, so an audience that doesn’t attend theatre regularly is unaware of Wilson’s importance. I first saw Wilson’s work in 1995 as a high school sophomore. 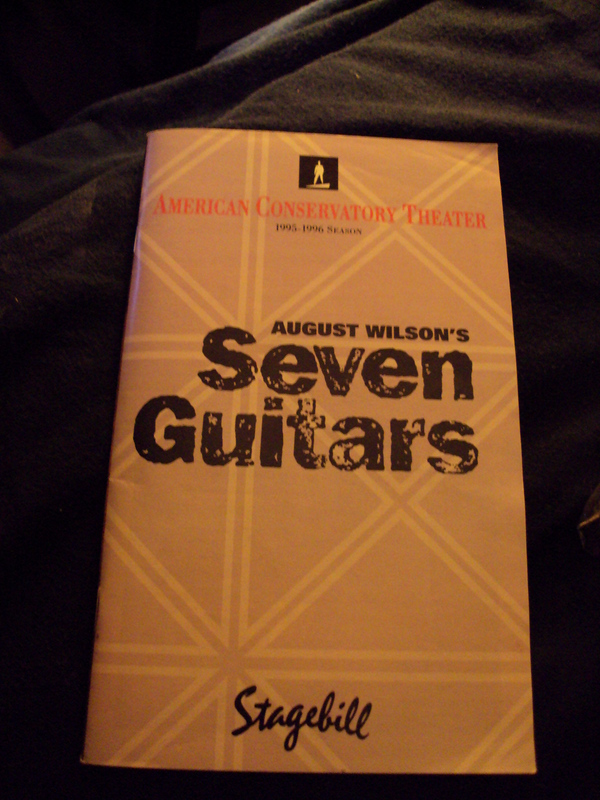 The ACT hosted the West Coast premiere of Seven Guitars and I caught the post-show talkback with castmember Ruben Santiago-Hudson. Santiago-Hudson is behind the WYNC readings and reprises his role of Canewell. It excites me to think who might listen to those readings. I’d like to think that somewhere some “bougie” Black kid will have his/her first taste of one of American theatre’s greatest voices and be inspired to use his/her own. Who knows?